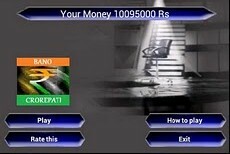 Combine three of the most popular pastimes: Quizzes, multiplayer games and competing on Who wants to be a Millionaire with Android Phones and you get Con Bano Crorepati. Say what! Well the strangely named app, (is this the first Android Urdu App name to make it big), is basically the equivalent of the Indian 'Who Wants to be a Millionaire' And the funny thing is it's setting the Android Market on fire! Now ever since Slumdog Millionaire made the West sit up and take notice there's been a massive cross cultural pollination between Western Culture and Indian Culture. Hence the strangely named quiz app not just being popular in India but also throughout other Android markets. Half a Million Indian Quiz app downloads in a few weeks is some startling figures.And where else would you be answering questions about Indian Politics and Cricket! The only problem with Bano Crorepati is that it needs to have more questions, if the developer supports the app with a lot more questions, both Indian quiz questions and Western quiz questions (is this the most Cricket questions in an Android app ),then the 'Indian Millionaires' popularity will continue to soar. 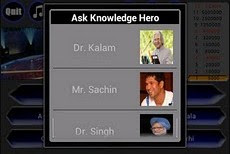 Indian friends when playing this have been especially enthusiastic in answering questions for Rupees instead of dollars and why call a friend when legendary Indian icons such as Dr. Kalam (?) and Sachin Tendulkar are on hand to answer questions. So much the same as you'd expect from an Android Who Wants to be a Millionaire app except with an exotic Indian quiz flavour. Fun ,multiplayer game of the year so far? Fun ,Indian Quiz Multiplayer Game of the Year? Definitely! 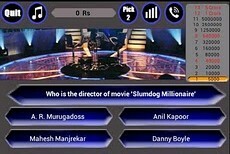 Is that Sachin Tendulkar in a Quiz Game?